Located Downtown on Place de la Côte d’Armes Street with 883 sq. ft. This 1-bed 1-bath condo features hardwood flooring, recessed lighting, 11-foot ceilings and en-suite bathroom. With refined and minimalistic aesthetic, this fully-furnished one-bedroom and one-bathroom condo is ideal for your next VIP stay in Montreal. The bright open-concept floor plan is spacious and offers everything you expect from a Simplissimmo property: fully-equipped modern kitchenette including breakfast bar and stools, 6-person dining table for dinners at home, as well as a den area complete with flat screen TV and comfortable pull-out sofa that can be used for an extra guest. The closed, queen-size bedroom is quiet and the en-suite designer bathroom features separate soaker tub and walk-in shower. The unit also includes a practical linear work desk as well as stackable washer/dryer closet for your convenience. Style and comfort, Simplissimmo has it all! Originally dating from 1890 and used as the Montreal Tramways Company headquarters and then owned by the Bank of Montreal, the prestigious Europa building was beautifully restored and converted into luxury condominiums in 2007. Protected as a cultural heritage site, the 8-storey grey-stone structure was considered as one of the finest buildings in the financial district of the time and today retains its original façade and character. Building amenities include elevator and central air conditioning. 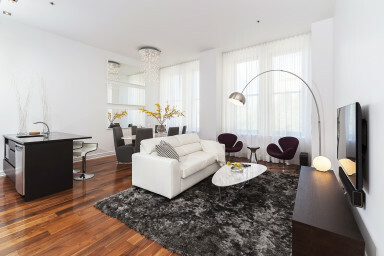 Serviced by the Place d’Armes metro station, this particular address is located on the cusp of Downtown and Old Montreal and gives you easy access to almost everything the city has to offer. Immediately at your doorstep, you’ll find the magnificent Notre-Dame Basilica and square, as well as the popular rooftop terraces of the Place d’Armes and Nelligan hotels. Just up the street, the colourful Palais des Congrès offers many business and commercial services with access to the Underground City, a pedestrian network of high-end retailers, boutiques and restaurants connecting much of the downtown core. Surrounded by the charm of Old Montreal, with the always effervescent Old Port just minutes away and the buzz of the Downtown within walking distance, come discover what makes Montreal quite so special! Please note that Special Prices apply only for the first 30 day period following a rental. Following such period, the regular prices apply for the rest of the stay period.